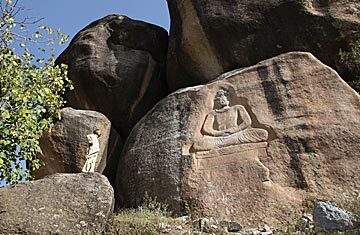 An ancient Buddha carved into into a mountainside in the Swat Valley has been defaced after Islamic extremists attacked the historic relic at Jehanabad. In the mountains and valleys of Pakistan's Northwest Frontier Province, palace ruins and crumbling Buddhist monasteries dot the hills above war-torn locations such as Mingora, Peshawar and the Swat Valley. These magnificent ruins are all that's left of the Gandhara kingdom, which flourished from the 6th century B.C. to the 11th century A.D. It vanished under the pressure of war and conquest, re-emerging only in 1848 when relics and ruins were re-discovered by the British archaeologist, Sir Alexander Cunningham. Now, Gandhara is in danger of vanishing a second time from the same old threats. Just as the Afghan Taliban destroyed the 1,500-year-old statues of the Buddha in Bamiyan, Afghanistan in 2001, militants in Pakistan have attacked the Buddhist heritage in Pakistan, driving away foreign research teams and tourists, forcing the closure of museums and threatening the integrity of valuable digs. "Militants are the enemies of culture," says Abdul Nasir Khan, curator of the museum at Taxila, one of the country's premier archaeological sites and a former capital of the Gandhara civilization. "It is very clear that if the situation carries on like this, it will destroy our cultural heritage." The Gandhara kingdom and its art are important because it shows the impact of Hellenistic influence brought by Alexander the Great and his Macedonians. Likewise Gandharan Buddhist art reached as far as China, Korea, and Japan. After it became part of the pre-Islamic Persian Empire, Gandhara's culture went on to influence artistic developments in the Middle East. Peshawar, Swat and much of northern Pakistan lay astride a portion of the old Silk Road, the ancient highway that transported riches between the east and west. Indeed, the Jehanabad Buddha looks out over a stretch of the old path. Later, in the 7th century, Swat Valley was the birthplace of Tantric Buddhism, and Chinese pilgrim Xuanzang described the valley as home to hundreds of Buddhist sculptures, monasteries and stupas. Only a fraction has been excavated so far. Taxila should be a showcase of that civilization. Today a town about 20 miles northwest of Islamabad, it was a center of Buddhist learning, a must-visit for travelers like Xuanzang seeking Buddhist scripture and wisdom. Formerly part of the Persian Empire, Taxila was one of Alexander's conquests and is today a World Heritage Site. The museum there, started in 1918, is one of Pakistan's finest, with more than 4,000 artifacts from the Gandhara civilization. But no one comes to visit much anymore. Nasir Khan says there have been warnings of a possible attack on the museum, and some security procedures have been put in place, but he said they're insufficient. The anxiety is palpable. In the last five days alone, Taliban militants have killed more than 100 people in near-daily bombings across the country in Peshawar, Rawalpindi, Lahore and now Multan. Foreign archaeological teams are being told not to come, warnings issued by their own governments or their institutions because of fear for safety. Local diggers can't get out to crumbling sites for security reasons as well. The lack of archaeologists at many sites has led militants and vandals to close in. Kashmir Smast, about 70 miles northwest of Islamabad, is a Hindu site, not Buddhist, and thus unusual for the area. "But there's no preservation, no one to look after the site," says Dr. Nasim Khan, professor of archaeology at the University of Peshawar. "The local people are damaging the site because of illegal diggings." In Swat, the Taliban have long attempted to destroy the Buddhist heritage of the region. In October 2007, as militants cemented their hold on the former tourist area, the Taliban dynamited the face of the Jehanabad Buddha into oblivion. The 23-foot-high carving of the seated Buddha, dating from the 7th century, is regarded as the second most important Gandhara monument after the Taliban-eradicated Bamiyan Buddhas. Dr. Fazal Dad Kakar, the director general of the Department of Archaeology and Museums, played down the damage done to the carving as the work of local villagers, not Taliban. Regardless, it shows that even without a direct threat from Islamic militants, the lack of security means important sites are unprotected and ill-preserved and can fall prey to vandalism and looting. Robert Knox, who was Keeper of the Department of Asia at the British Museum until 2006, gave up on coming to Pakistan in 2001 after 9/11. He was working in Bannu agency on the border of Waziristan. Today's it's an active war zone. "We were in Bannu for a very, very long time," says Knox, who excavated there from the mid-1970s to 2001. "We scratched the surface. There's still an enormous amount to do and sites are lost more or less daily. It's almost a free-for-all, particularly in difficult war-like areas." Foreign teams bring a lot of money for conservation and excavating, money the cash-strapped Pakistani government doesn't have to spend on preserving antiquities when it has a war to fight. The University of Peshawar's Khan says that there are usually excavations on the outskirts of Peshawar and Taxila, but even he can't go to these sites anymore, much less foreigners. To his knowledge, he said, there are no foreign teams scheduled to come to Pakistan. "We are not taking the risks to bring them to the sites," he says. "We need their help, we need to involve them. But unfortunately, that's not been happening for the last two years." Foreign contracts also often include a commitment to help preserve and develop a site after the initial research is done. Without that, excavations are being started and then left open when local funding dries up, Khan says. "We don't have the resources to protect each and every site in Gandhara," he explains. "We don't have any resources to make it a model site for tourism, which would create jobs and bring in money." Speaking from his home in London, Knox says that it would be catastrophic to lose Gandhara and other ancient civilizations that sprung up along the Indus Valley to direct threats from militants or neglect caused by the security vacuum. "Journalists can't even go there, quite apart from people who want to do field archaeology," he says of the sites near Waziristan and other war-ravaged locations. "I don't think I shall ever see those places again."